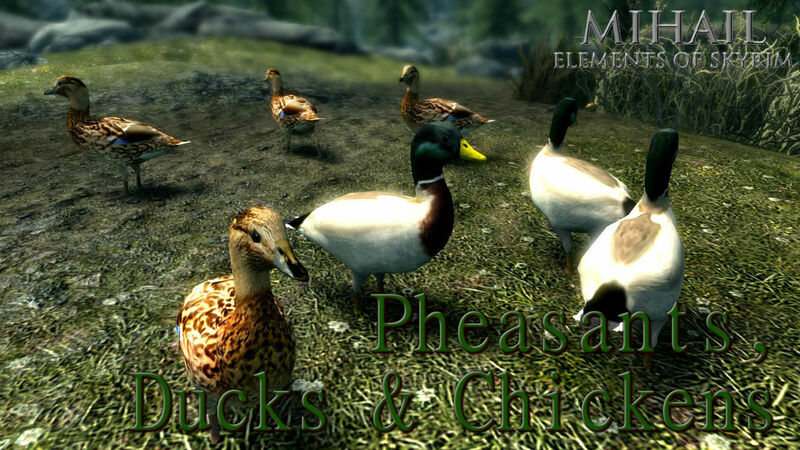 Modd adds 12 variants of Chickens (including rooster and chick), 9 variants of Pheasants (males and females), 20 variants of Ducks (males, females and ducklings) and 1 variant of terrestrial parrot (Kakapo), all with custom loot and sound. 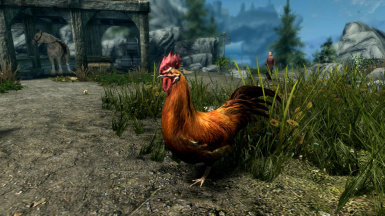 Chickens, Roosters and Chicks can be found on farms and mills, and this mod adds two variants of common rooster, 1 variant of chick, and 6 variants of Bantan Chicken and 3 of Bantan Rooster, commonly you will find just one rooster per place, eventually a rooster and a bantan rooster. 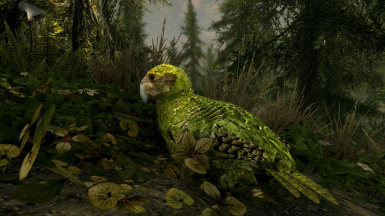 Kakapo is a big terrestrial parrot, almost extinct, native from Cyrodiil, Valenwood and Elsweyr, some can be also found on the pine forest of Falkreath. 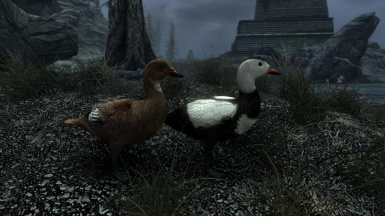 They are very rare, and only a few remain. 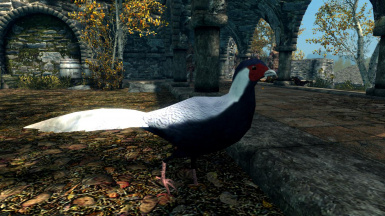 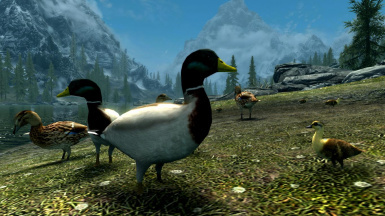 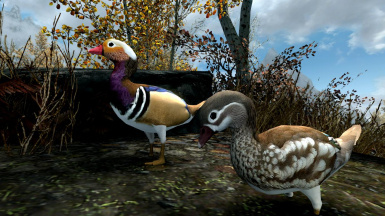 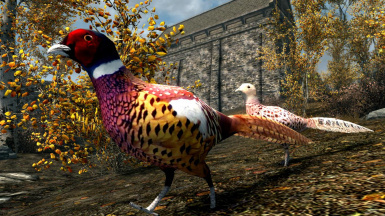 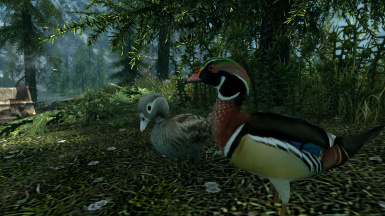 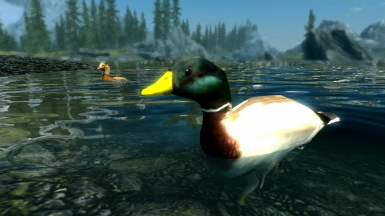 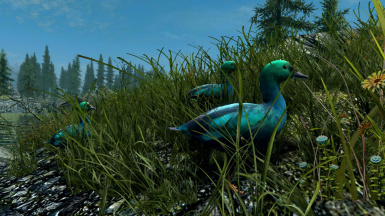 You can fin 6 pheasant types native to Skyrim, the common one in both female and male variants, the green pheasant and the white pheasant, both also in both gender variants. 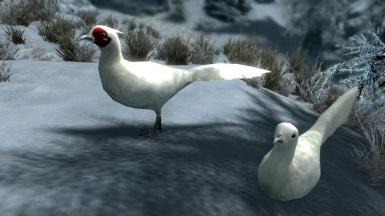 This last one only in snow places. 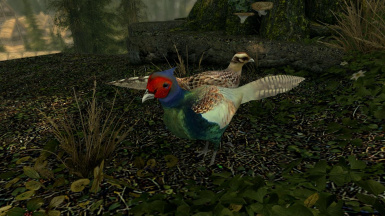 The jarl of riften also have one male silver pheasant as pet on the garden, and blue palace court have a couple of peacock pheasants. 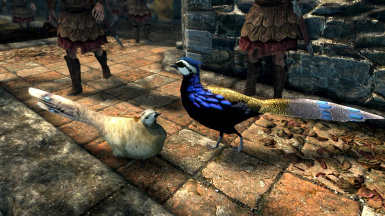 (Also donwload my Peacocks mod cus it add peacocks to that courts too). 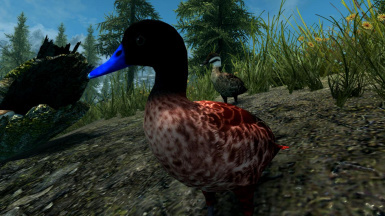 You can find 30 variants of duck, commonly in both gender variants, the farm duck on the farms with ducklings, and the wild ones like mallard, green winged teal, cinnamon teal, black mallard, brown wigeon, saltwater duck (the only one that lives on the coast), blue duck. 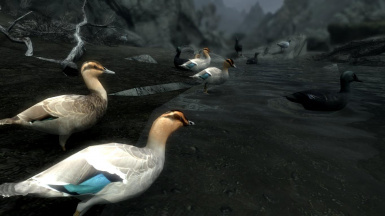 Also some species are migratory, others are just rare sporadic visitors of the province, and you will find this last ones in very small flocks. 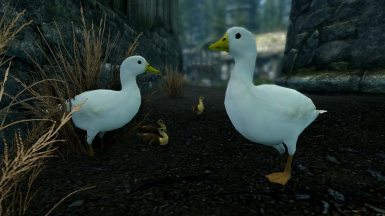 You will find them close to the provinces from where they come from. 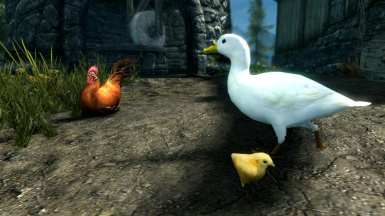 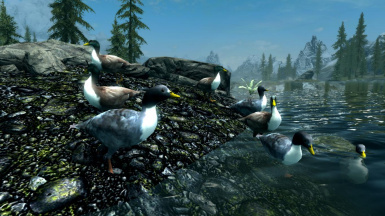 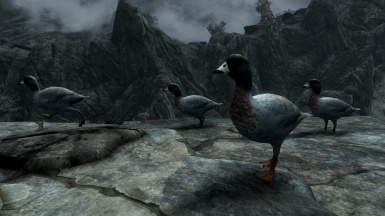 Hammerfell black ducks and Craglorn ducks can be seen sometimes on the reach, Cyrodilic blue duck, Colovian duck, Emperor duck come from cyrodiil, and so on are more common between rift and falkreath hold, Valenwood Shelduck, Corinthe duck and Emerald duck come respectively from Valenwood, Elsweyr and Black Marsh, so on they are really very rare. 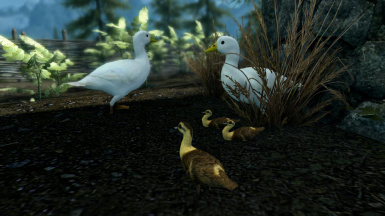 Some live in groups, others in couple, some come to reproduce so they have ducklings with them. 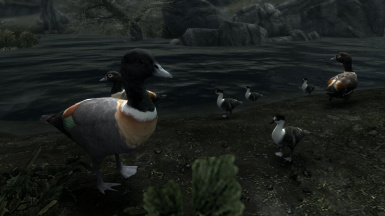 Some also are very sociable and can be seen in inter-species groups close to rivers and lakes. 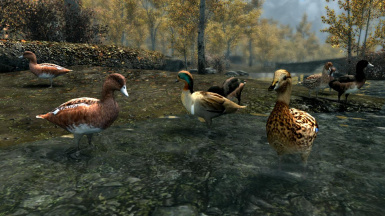 Some species prefer rocky waterfalls, other rivers, some prefer calm lakes. 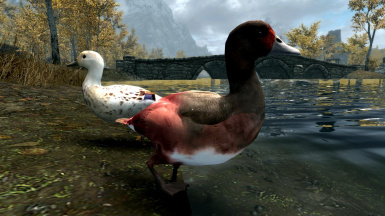 All do respawn of course. I believe that the mod will not be incompatible with any other mod. 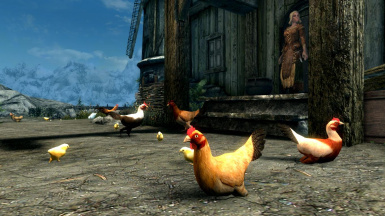 settlements, that will fill some empty spaces and plotholes in that province.